Panoramic prints on canvas - photo prints from your beautiful panoramas. 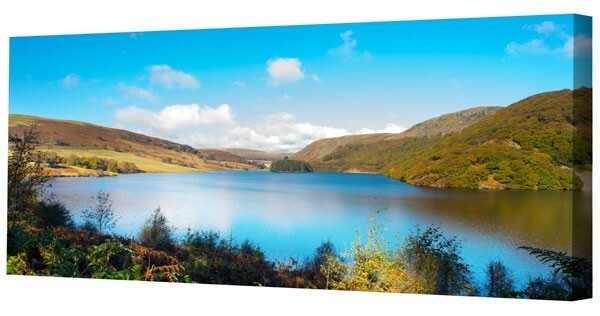 Stunning quality with vibrant colours, panoramic prints on canvas stretched and hand-framed onto natural pinewood bars. 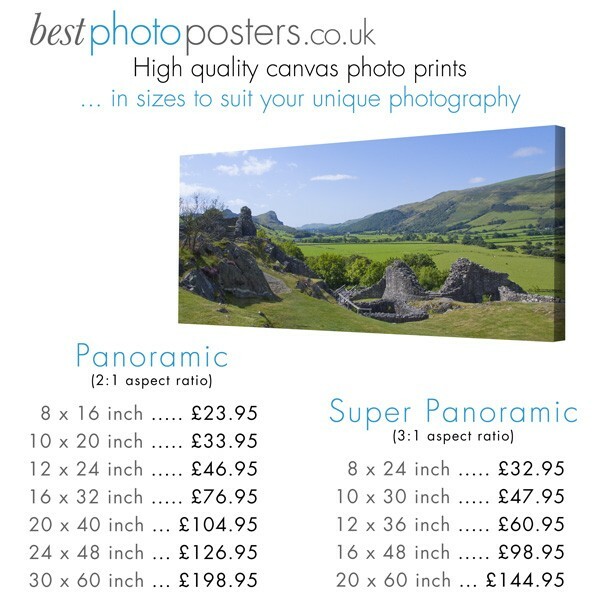 Panoramic prints on canvas from your wonderful holiday pictures or favourite views. Your photos of beautiful landscapes or remarkable sunsets can be turned into panoramic prints on canvas. Our unique range of sizes has been specially created to fit phones, mobile devices and cameras, supplied complete with wall hanging attachment. *Would you like to add text to your canvas print? Panoramic prints on canvas - photo prints from your beautiful panoramas. Stunning quality panoramic prints on canvas, stretched and hand-framed onto natural pinewood bars. Panoramic prints on canvas from your personal pictures of special holidays or favourite views. Your photos of beautiful landscapes or remarkable sunsets can be turned into panoramic prints on canvas. Our unique range of sizes has been specially created to fit phones, mobile devices and panoramic cameras. Stunning quality with vibrant colours; hand-framed on 38mm deep pinewood and supplied complete with wall hanging attachment. Despatched from the UK within 2 to 3 working days. Our large canvas pictures stand out, offering superb image vibrancy, quality and longevity. We offer a very personal service. Our goal is to provide with a very high quality product for you to be entirely happy with it. Panoramic prints on canvas are perfect for birthday presents, anniversary gifts, christmas presents or simply your own personal wall decor. Your personal photo can be turned into artistic canvas printing or a beautiful gift. We will contact you if for any reason we feel that your uploaded photo is not of sufficient quality. As photo panoramas come in a wide variety of sizes, we are happy to create a size especially to suit your image. 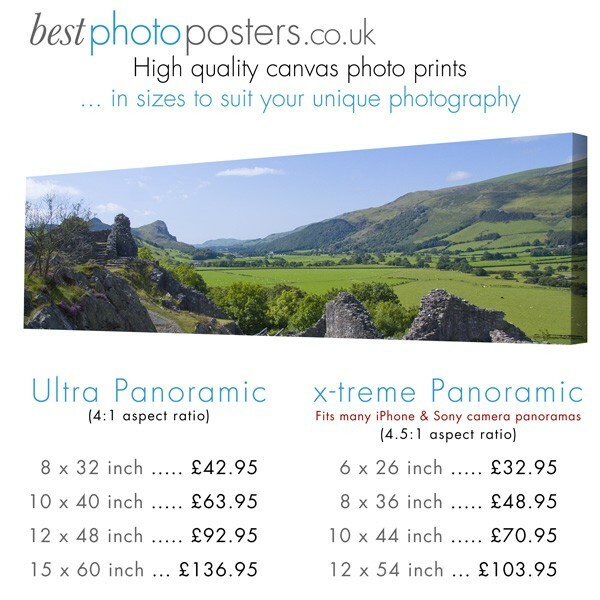 If your panorama is wider than the sizes here, why not try our x-tra wide panoramic prints. If you would like any assistance prior to ordering, please contact us. If your composition is large, sometimes you may experience difficulty uploading. Though our website can easily handle files larger than 200Mb, sometimes internet connection speeds may cause difficulty. If this is the case, please contact us for an alternative upload method. Questions? - Visit our canvas printing information section. We offer a uniquely personal service, always ensuring that your image will be printed at its best. Despatched in 2-3 working days. Delighted with my panoramic canvas print - will definitely use this company again. Thank you, fantastic service from start to finish, I am so happy with my canvases, I will be using you again in the future. Just received by panoramic canvas print of Buttermere. I am really pleased with it. It is for an engagement gift and I feel sure they will love it too. Excellent canvas prints and speedy service. Thanks! Image didn't want to upload on the website, because was it was so large, so wetransferred it instead. Very fast delivery & looks great - thank you. Print quality was superb. Price was fairly reasonable for the size I chose. Delivery could have been quicker but it arrived safely anyway. This second canvas print I've had made here was every bit as good as the first. Great service. First ever canvas - will be getting more from you. Fast delivery and great quality. Am absolutely delighted with my canvas - one of the best things I have ever ordered and the service and quality and efficiency of your company is first class!! I was blown away with the canvas to be honest - excellent service thank you. Very happy with the service a quality of the print. Arrived quickly and packaged well. Will be using again. The Canvas arrived quickly and well packaged and was as good as I hoped it would be. Thank you so much. The canvas is beautiful. Absolutely love this canvas picture. I tried all different places to get a panoramic canvas that fits the picture I wanted on it and you were the only company I could find. I got this for a Christmas present for my mum and was so impressed that I have ordered another one for me and my husband for our house. Fantastic quality and speedy delivery. I will definitely be using you again in the future. I absolutely love my print. We have a few of these canvases which I have bought from various places, but this one is by far the best quality. I will definitely buy from you again. The prints arrived today, they are excellent thanks! I just received my order and I just wanted to send a massive thank you as the item is amazing and great quality. My boyfriend will hopefully love it (for Christmas) many thanks again. Fabulous speedy service - placed an order Saturday evening and received the canvas by lunchtime on Tuesday! It was extremely well packaged and looks fantastic!! Great quality and will definitely use the service again! First time we have had a panoramic photo put on canvas we are very pleased with the result and the range of options that were available by this company, value for money is good with very speedy delivery. I have just received my canvas and am delighted with the quality of product and the speedy service. Thank you so much for the canvas. It is stunning. We really can't believe that a picture off a phone could be so detailed. The photo meant so much to my wife too. It is where she grew up. She was so so pleased. Best wishes and thanks again for all your help. Having tried local companies to produce panoramic canvasses, with results that did not satisfy me, I was not over-optimistic about risking an online company. What prompted me to go with BPP was the clearly laid-out list of options, including the opportunity to have the whole picture, sensitively presented, without important parts of the image being lost when wrapped around the frame. The "reflect image" option was ideal, and my perfectly printed canvas arrived within 4 days of placing the order. I have just received the prints and they are much better than I expected. I was worried that I may not have gotten the brightness correct but they great. Such an amazing service! As I was unsure on the perfect size for my holiday picture I contacted best photo posters and they were very helpful, advising me on the right size etc. Having placed my order my canvas arrived far quicker than I was expecting if to! Was delighted when I opened it up. Perfectly packaged to keep it safe, the quality of the print is amazing. Fantastic service and fantastic product!!!! Delivered unbelievably quickly and the print is great. We would definately use your company again. Thanks. I ordered a 4:1 panoramic print, the quality is great and the colours look fantastic. It was also very helpful to be emailed a proof of how the print would look and have the chance to change the border options (plain white, mirrored etc). Looked high and low for a place that would do a longer than 5:1 panorama and these guys were one of the few. Very pleased with the service received - quality product and a quick delivery. Have just received my panoramic canvas, it is superb, thank you.